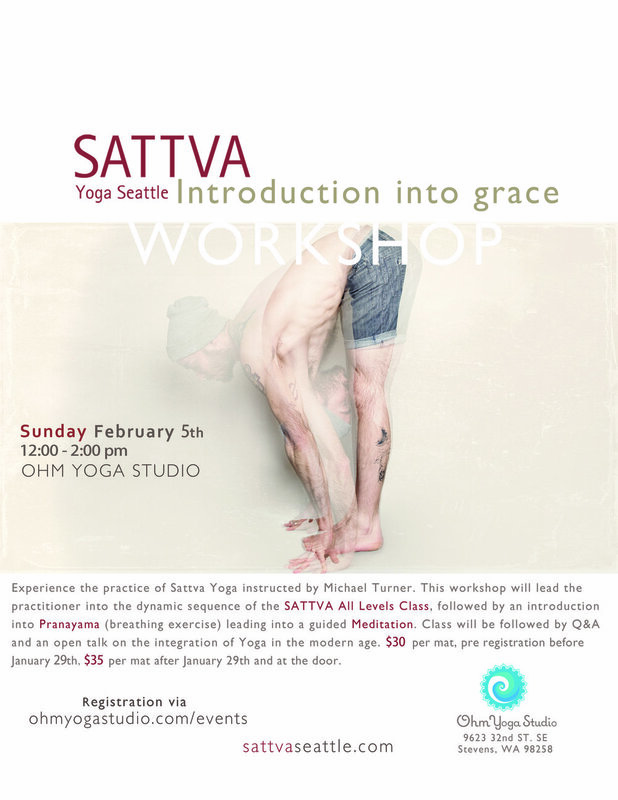 Join Michael for an immersive two hour experience of Sattva Yoga Seattle: Interdiction into grace. In this workshop we will be engaging with the body like never before through the dynamicAll Levels Sattva Yoga (Vinyasa) sequence. Through which we will be cultivating our awareness within the tissue of the body allowing for a heightened sense perception and relation to the outside world. · Fluidity of the Sattva Yoga Sequence: The relationship Sattva has with Vinyasa flow and how it brings about a balanced and healthy body. · Introduction into Pranayama: (breath restraint) Through the practice of breathing exercise we will be exploring the therapeutic aspects of pranayama and how this ancient meathead of yoga is interrelated in the Sattva Yoga practice. · Guided Meditation: Following the breathing exercise Michael will guide the practitioners into a guided meditation allowing for those with little too no experience in the practice an opportunity to enter the grace and peace that meditation offers to all. · Yoga Talk: To close, Michael will be providing a small talk on the integration of Yoga in the modern age, and how this timeless practice can be utilized in ones daily life. This will be an open discussion with a friendly Q&A for all in attendance.